Christopher Nolan’s outer space sci-fi concept is not terrible — it’s just such a chore. Directed by Christopher Nolan. With Matthew McConaughey and Anne Hathaway. Now playing. Here’s a subjective, notebook-style set of impressions of Christopher Nolan’s Interstellar, an outer space sci-fi concept that does not need to go on for almost three hours. First Hour: Planet Earth is a mess due to climate change. The countryside, where corn farmer and ex-astronaut Cooper (Matthew McConaughey) lives with his family, is ravaged by frequent dust storms. Food is scarce; oxygen is fading. But Cooper’s young daughter Murph (Mackenzie Foy) and teenage son Tom (Timothée Chalamet) are smart and determined to do their part to save what’s left of the world. 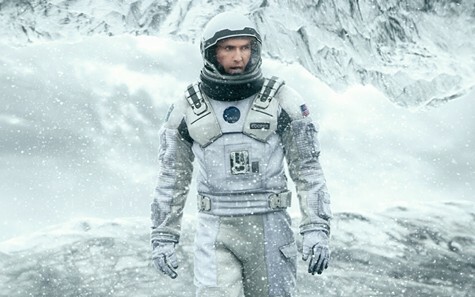 All of a sudden, Cooper is recruited by Professor Brand of NASA (Michael Caine) to captain a space exploration mission. Its objective: To fly past Saturn and shoot through a cosmic “wormhole” to another galaxy in search of a new Earth to take the place of the ruined one. In other words, to save the species. On board is Brand’s daughter, Dr. Amelia Brand (Anne Hathaway), plus several crew members and some chatty robots. That’s a suitable start to a galactic adventure, but the cinematography — in the IMAX presentation I saw — is dark and indistinct. At first that seemed a deliberate nod to the dustbowl environment, but later, even in the pristine atmosphere of outer space, the murkiness persisted. Perhaps it has something to do with director Nolan’s well-publicized insistence on shooting the movie on film instead of digitally. The lasting impression is how fuzzy and nebulous the film looks. There is ominous talk of biogenetic seeding. We get the feeling that NASA knows the mission has no hope, and that Cooper and his crew are not meant to return home. Second Hour: After passing through the black hole Gargantua, the spaceship Endurance visits Miller’s Planet, an Earth-like place in which mile-high tidal waves put potential human pioneering out of the question. The expedition picks up Dr. Mann (Matt Damon), a voyager who’s been on ice for years in another ship. The sleep must have affected his brain. He and Cooper tussle on a desolate gray planet of icy chlorine crystals. Meanwhile, back on Earth, Murph and Tom have turned into Jessica Chastain and Casey Affleck. One hour on the far side of the wormhole equals seven years on Earth, so time is quickly running out for everyone back home. By that measure, we’re wasting about nineteen years watching an expensive, long-winded bummer (with ten times the dialogue of Gravity) that goes nowhere but covers up its threadbare plot with a smattering of science. Genre movies can fail, but no other genre fails quite as disastrously as bad sci-fi. Nolan, of course, is the British-born maker of the mega-hit Dark Knight fantasies — but he also made the more dubious Memento and Inception. The screenplay he and his brother Jonathan Nolan wrote for Interstellar displays the same tendency toward broad dramatic strokes at the expense of fine-grained characterization that has always plagued “serious” space spectacles. We don’t really watch stuff like this to see Cooper fall in love with Amelia — we watch it to see strange new worlds. Or if that doesn’t happen, then to watch a spacecraft spinning around and exploding. We get plenty of the latter and not nearly enough of the former here. The effect is flat and dull instead of spine-tingling. I checked my watch more than once. Third Hour: This movie saves its special sound and light show for Act III. After some exposition about the space-time continuum and “gentle singularity” (that’s black-hole talk, mostly gratuitous), Coop’s flyboy heroics take over. Hans Zimmer’s music score and the sound engineering rock the theater walls, and the quest ends up in quasi-religious scenes all too familiar to sci-fi flicks trying to explain physics — à la Kubrick, in the stacks of god’s library, on the outside looking in, where we’re taught the essential mysteries of time, love, gravity, and the ghosts all around us. McConaughey, Chastain, and Hathaway emote convincingly. Once again, as before, Love is the Fifth Dimension. Interstellar is not a terrible movie, it’s just such a chore.